It was a dramatic resumption for members of the National Assembly, especially for Dino Melaye as he offered himself to dust Saraki’s seat. 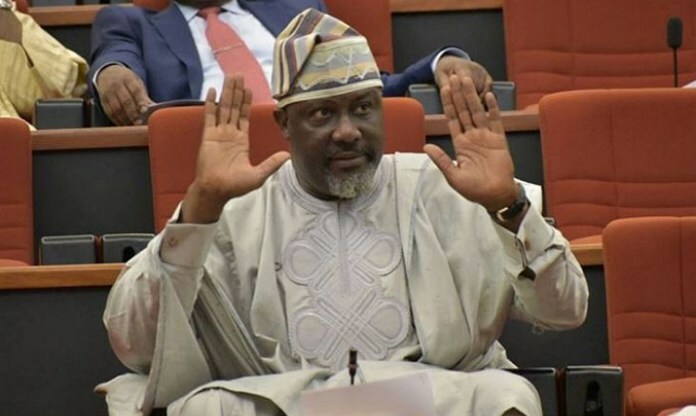 The Senator representing Kogi West, Dino Melaye, was on Tuesday seen dusting Bukola Saraki’s seat in the legislative chamber, shortly before the senate went into a closed session. Our correspondent observed that the senator did that apparently to show that he was still loyal to the Senate President. The National Assembly came alive again following resumption of plenary by the lawmakers. The News Agency of Nigeria, NAN, reports that the premises of the assembly was busy with lawmakers and national assembly workers seen going about their businesses. Visitors were equally seen thronging the premises, while security agents were observed in their numbers from the first gate of the assembly to the White House. NAN further reports that besides protest by national assembly legislative aides over alleged non-payment of over N5.8 billion allowances, other people were seen conducting themselves peacefully. This is contrary to fears that the resumption would be rowdy due to threats to impeach the President of the Senate, Bukola Saraki and Speaker of the House of Representatives, Yakubu Dogara. Both chambers were as at the time of filing this report, seen conducting their legislative activities peacefully. The National Assembly had proceeded on its annual recess on July 24, but could not resume on September 25 as scheduled due to the recent party primary elections. Some of the issues the lawmakers are expected to deliberate on are: the 2019 Election Budget, confirmation of appointments, approval of loans and passage of pending Bills.